Both my mom and my grandmother would make excellent crumble for dessert and often. If it was a fruit, a crumble could be made from it. The first picking of plums has happened in our area so to me this just seemed like the right time to make a plum crumble. The beauty of this recipe is that you can substitute any fruit that is in season and it is so easy to make! You can even pre-make it, store it in the fridge all day, then bake it while you eat dinner. Freshly baked crumble for dessert, tada! In fact that’s just what I did here. In my family it’s not unusual to have leftover crumble for breakfast either. Hey, it’s oatmeal, fruit, and less sugar than most cereals! Just skip the ice cream for breakfast 😉 Another thing, your eyes aren’t tricking you. My picture quality is better. I got a new spiffy camera this weekend. Yay! Pit and slice the plums. Place in a sprayed 9×9 glass square pan. Combine oats, sugar, margarine, and cinnamon in a bowl. Use a cutting motion with a wooden spatula to combine. You want oat clusters, not one big oat mess. Crumble the oat mixture on top of the plums. Store in the fridge until ready to bake or bake immediately at 375F for 30 minutes. This makes four servings. Each serving contains 132 calories, 3.8 grams of fat and 2.1 grams of fibre. This is great served with a bit of no sugar added ice cream, low fat frozen yogurt, or even still frozen fat free cool whip scooped out like ice cream. 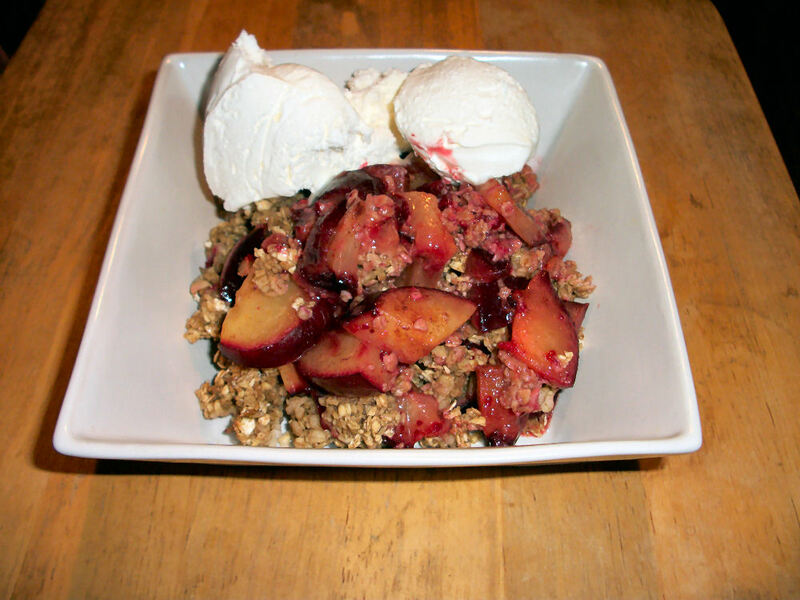 This entry was posted in Breakfast, Comfort Foods, Dessert and tagged Oatmeal, Plum. Bookmark the permalink.